The District bills its customers for sewer and water services on a calendar quarter basis in arrears. Bills are mailed out the first week of January, April, July and October of each year. The service charges for sewer and water are calculated from water meter readings which the District collects for each billable property. Most of the water meters are connected to the phone system and call in to a computer at the District office on a weekly basis. Meters without phone service are read manually at least once a quarter for billing purposes. Please go to the water meter page for information about our water metering program. This page has information about reading your water meter and links to technical information about our meters. For wastewater permitted projects on Westland/TM land in Section 1 the inspection fee shall be 50% of the applicable inspection fee. 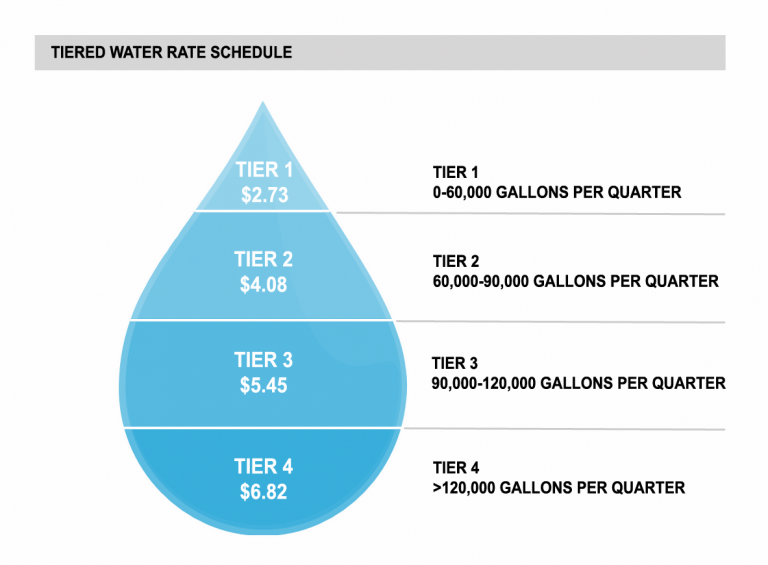 • Variable Rate charged for every 1,000 gallons of water use. $6.55 Per 1,000 Gals. • Variable Ratecharged for every 1,000 gallons of water use. Tier 1: 0 to 60,000 Gallons $2.73 Per 1,000 Gals. Tier 2: 60,000 to 90,000 Gallons $4.08 Per 1,000 Gals. Tier 3: 90,000 to 120,000 Gallons $5.45 Per 1,000 Gals. Tier 4: > than 120,000 Gallons $6.82 Per 1,000 Gals. Plant Investment Charge (PIC): For Boyne owned lots (i.e. Cascade, Mountain Village, etc) as of July 25, 1997, the PIC charge is $7,000 per SFE ($3,500 PIC and $3,500 surcharge) as itemized on permit.